Ah, Sunday Brunch…the great American past time for the hair of the dog or just a leisurely meal with family and friends. On a drizzly Sunday morning in Wilmington,we venture downtown, or more accurately to the artsy side of town, to enjoy brunch at a well respected eatery called Rx. We start with DIY mimosas and a bloody mary. DIY means they bring you a bottle of brut champagne and a mason jar of freshly squeezed OJ. Fun! The Bloody is spicy and loaded with veggies..a veritable salad in a glass! Cucumber slice, olives, pickle, lime, lemon…did I forget anything? 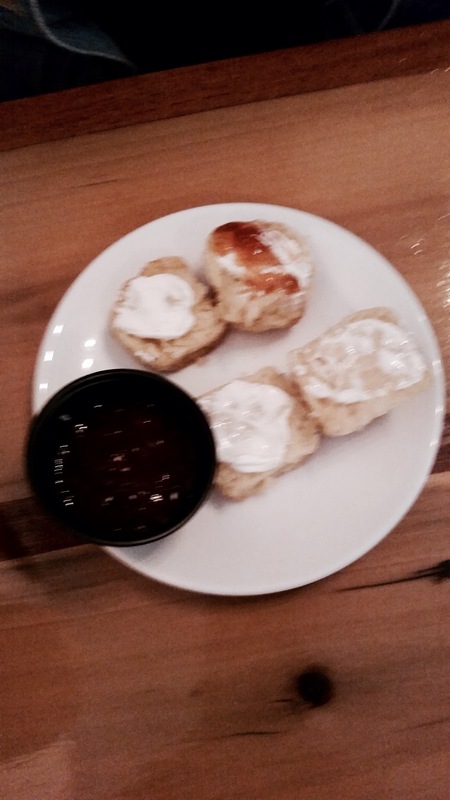 Next come house made mini biscuits that are flaky, buttery and just plain delicious. 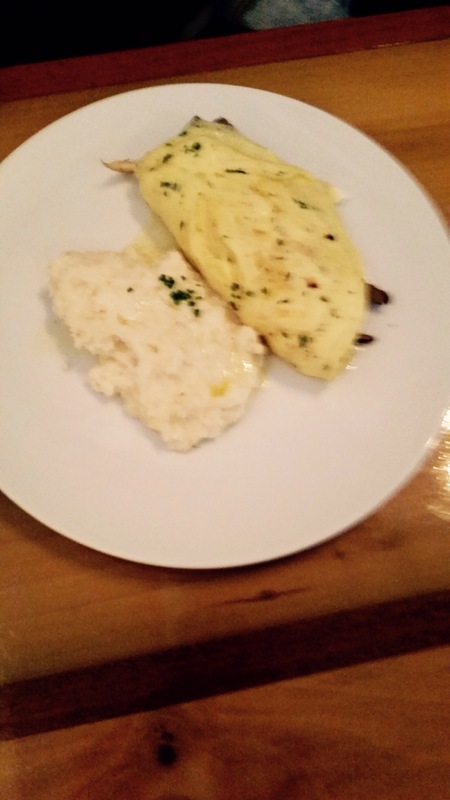 We decide on a goat cheese and mushroom omelette with a side of some of the best grits we have ever eaten out. Smoked cheddar is the secret ingredient that elevates this dish from the ordinary southern staple. 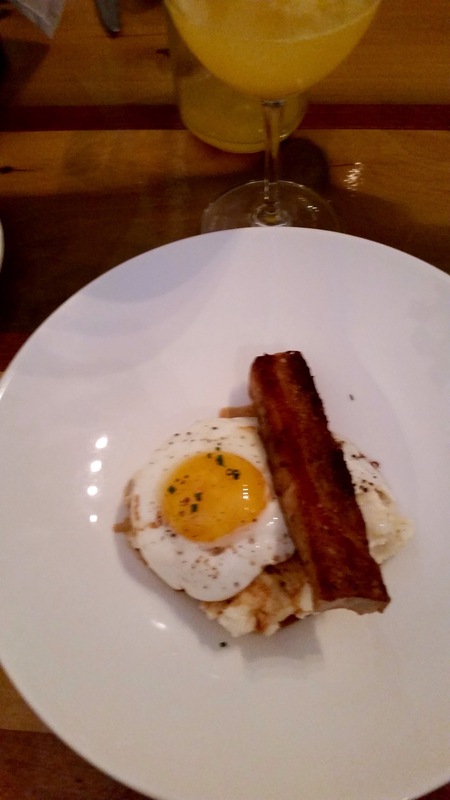 Braised pork belly over these same creamy, smokey grits topped with a sunny side up fried egg is just heavenly. The grits swim in a shallow pool of the braising liquid and the egg is runny enough to add to the unctuousness of the sauce. 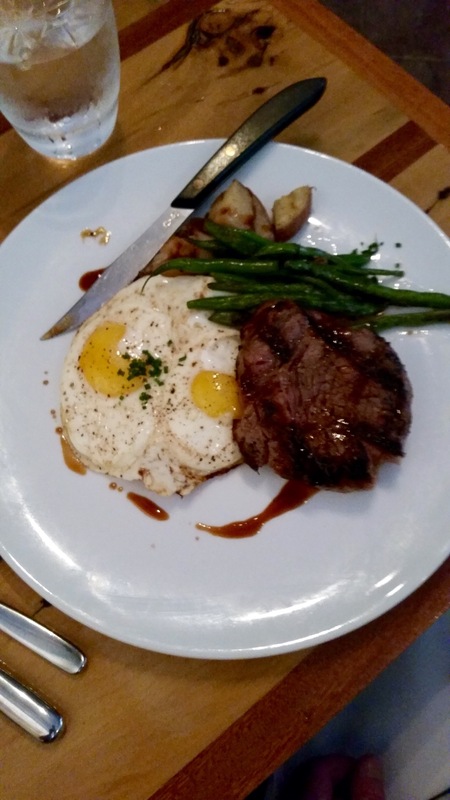 Our final entree of a take on steak and eggs is made even more wonderful by the pan roasted potatoes which serve as a pillow for the two fried eggs. And then there are the roasted green beans ( is that bacon fat they are roasted in, Chef?) salty, crisp and unexpectedly good. Although we are pleasantly sated by our main courses, we cannot stop ourselves from ordering a dessert. 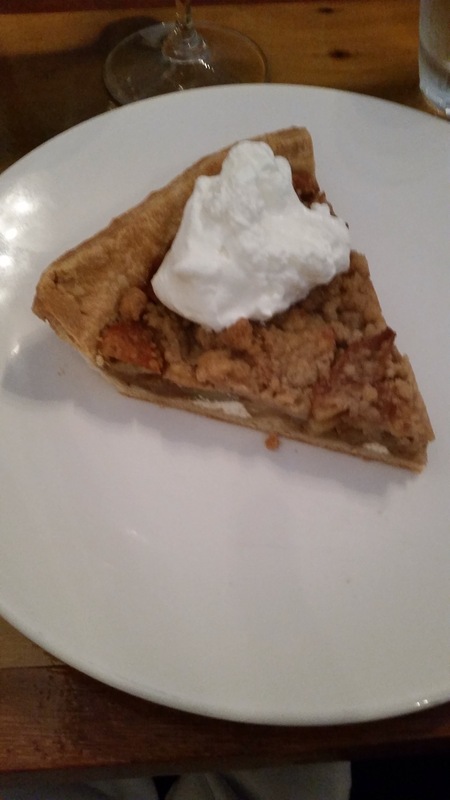 Apple pie with goat cheese with a goats milk whipped cream atop does not disappoint. Now top off a wonderful brunch experience food wise with attentive and informative waitstaff who understand the farm-to-table concept and what do you have? Rx is the right prescrition. Next Next post: Papa’s Got a Brand New Book!